The first Moto Guzzi I ever saw (to my recollection) was in 1998. Although I had been riding motorcycles for almost 20 years, Guzzis had just not been in my consciousness. The bike was a pristine black V7 Sport parked on a Denver side street. I was so taken by this bike that I left a note on the seat to tell the owner what a beautiful motorcycle he had and that I would love to talk to with him about it. To my surprise, a few days later, the owner gave me a call. We talked about the bike, but to my disappointment, I learned that he had just moved from Denver to another state and I would never get see his bike again. But, I will never forget the sight of that beautiful Guzzi and the impact it had on me. After that, I began to keep an eye out for Guzzis, but rarely saw any. I searched for pictures on the web and eventually found a number of the websites with which many of you are familiar. The more I read about Guzzis, the more the unique V-twin engine and Italian character took hold of me. 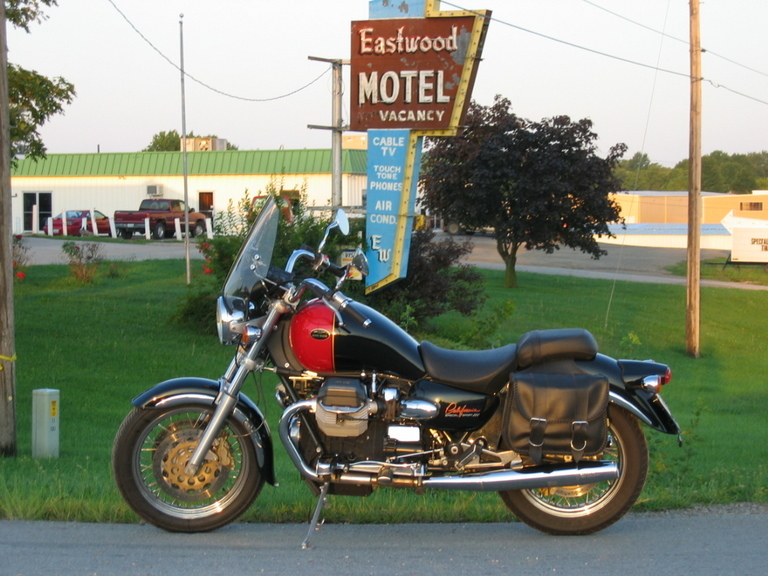 Finally, in July 2004, I purchased my first new Moto Guzzi. I had been riding a 1987 BMW K100 which had served me well, but the lure of the Guzzi had finally taken over. Colorado lacks for an "active" Moto Guzzi dealer, but I had found a dealer in the Los Angeles area that was selling leftover 2003 models for about $5,000 less than the "sticker price." To borrow a phrase, it seemed like a good idea, at the time. 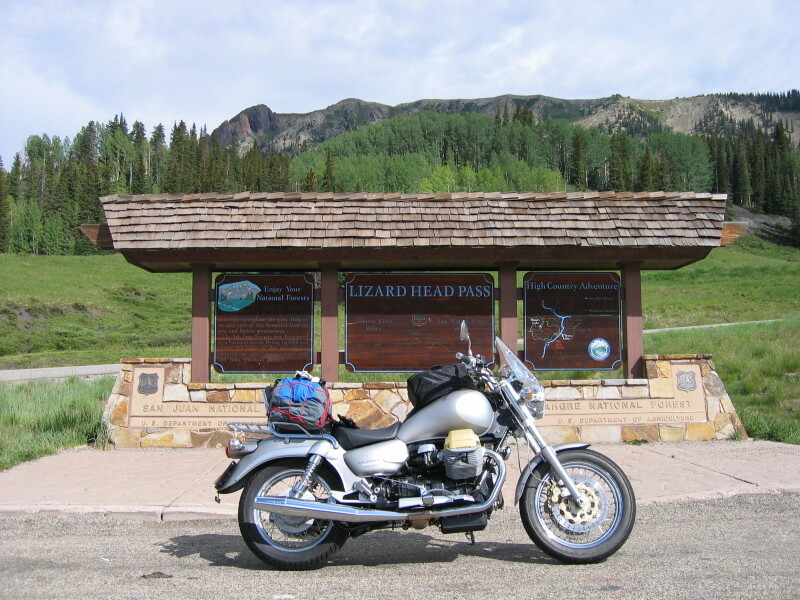 I bought a new 2003 Moto Guzzi California Aluminum sight unseen and a one-way ticket from Denver to Los Angeles to go pick it up. The dealer met me at the airport and drove me to the shop where I got the first glimpse of my new bike, sitting in a row of about eight identical bikes. This was the most Guzzis I had ever seen in one place and what a beautiful sight it was! The whole transaction was completed in a couple of hours. I headed out on the side streets to get the feel of the bike and stopped in a shopping center parking lot to adjust the handlebars, which gave me a chance to acquaint myself with a few minor details, like how to remove the seat and check out the toolkit. Everything seemed fine, so I headed south for lunch at San Juan Capistrano. The San Juan Capistrano Mission compound is right off the freeway and I spent about an hour touring it. Built in the 1600s, it contains some of the oldest buildings in the U.S. and the grounds were quite lovely. I had lunch in a Belgian restaurant across the street from the mission and then started up California 74 toward Lake Elsinore. I hadn't gone more than a couple of miles when I realized the speedometer wasn't working. I stopped and wiggled the cables and such to no avail and decided I had better go back to the dealer to get it fixed. I didn't feel like driving half way across the country without a speedometer. So, back to the freeway and north to the dealership. By this time, it was getting close to rush hour and I was worried about getting caught in traffic. The traffic heading south toward Capistrano was very heavy and would only get worse in another hour or so. I feared that what had started out as a leisurely day was going to turn into a disaster. The dealer took my bike right in and, while waiting for the cable to get fixed, I asked about the southbound traffic. Not good news, but fortunately there was a new toll road a few miles away they said would take me almost all the way back. They showed me on the map and, once the cable was fixed, I left the dealership for the final time, about four hours later than planned. The toll road worked great and probably saved me about an hour. It was wide open and dumped me back on I-5 about three miles from Capistrano. That three miles was all bumper to bumper crawl. Once off the freeway, I was back on a beautiful winding road heading up into the mountains. I crossed the coastal range and descended toward hot, crowded Lake Elsinore. Rush hour and Friday night traffic were in full swing and I worried about my air-cooled engine (and body) overheating at the traffic lights. I guessed that the temperature was in the low 100s. I slowly worked my way through Perris and Hemet and finally headed back up into the San Bernardino National Forest. As I climbed back into the mountains, I eventually got into Ponderosa Pine parkland that was beautiful and relatively cool. There was no traffic now and I was cruising along, happily enjoying the scenery and my new bike when I noticed the low-fuel light. I had started with a full tank and should have easily made it to my destination that night without worry, but I hadn't factored in the back-and-forth between the dealer and Capistrano. I didn't have any idea what gas mileage this motorcycle got and was now in the middle of nowhere. I stopped and looked at the map. The map showed a couple of "towns" between me and Palm Desert, but I had already passed through a couple of similar sized "towns" and the fact that they warranted a name on the map was the most remarkable thing about them. So better not count on a gas station. I consulted the owner's manual to confirm what I already knew, five-gallon tank, one-gallon reserve. The odometer showed 138 miles. Let's say the light came on at 130 miles. One trip between Capistrano and the dealer hadn't been recorded by the odometer, which added about 25 miles, so I had traveled, say, 155 miles when light came on. If that took four gallons, then I was getting 39 mpg. Not very good, and I estimated that I was eight miles into the one-gal reserve, leaving 31 miles to empty. I checked the map again. I didn't exactly know where I was, but I was near the "town" (otherwise known as "dot") of Thomas Mountain, which is 28 miles from Palm Desert. Well, no problem, then. Guess I should drive a mile-and-a-half up this side road and see what's there before I continue on....or not. I decided to adopt a more conservative driving style. It was starting to get dark and running out of gas up here would not be fun. I was still in the mountains and really didn't like going up hill. I could just see the fuel pouring through the injectors; so, when I came to a downhill stretch, I shifted into neutral and coasted. After awhile, I could tell that I was on the downhill stretch to Palm Desert. The sun was setting, but I could see far to the east now, the land in the distance away from the mountains still illuminated. The downhill proved to be continuous and I made it the last several miles into town on the coast. I bought 4.6 gallons of fuel. Dang, maybe I should have checked out that side road after all. The next morning, I headed out at daybreak to cross the Mojave Desert. I figured I could get all the way to Arizona before it broke 100 degrees. It was pleasantly cool early. When I got closer to the Colorado River, there was quite a bit of irrigation and I could feel the significant temperature drop every time I rode past an irrigated field. It had to be at least a 10 degree drop. Just past Blythe, Arizona, I left the Interstate for good and took U.S. 89 northeast toward Prescott. This road takes you through a lot of classic Arizona landscapes, with Saguaro-cactus-covered hillsides. As I approached Prescott, the road became mountainous and I was past the heat, which had never seemed too bad. I was just too happy to be out riding my new Guzzi to notice. This drive is spectacular and I really enjoyed Prescott, Jerome, and later, Sedona, which is where I stopped for a very late lunch. After walking around Sedona, I headed up Arizona 89A through a beautiful mountain canyon to Flagstaff. It was a fantastic ride and I reached Flagstaff in plenty of time to find a motel and have a leisurely dinner. The next day, I planned to go to the Grand Canyon, then through Monument Valley and on to Cortez, Colorado, for the night. It was a beautiful, but chilly, morning and I stopped for a cup of coffee on the way out of Flagstaff to warm up and wait for the sun to do its thing. 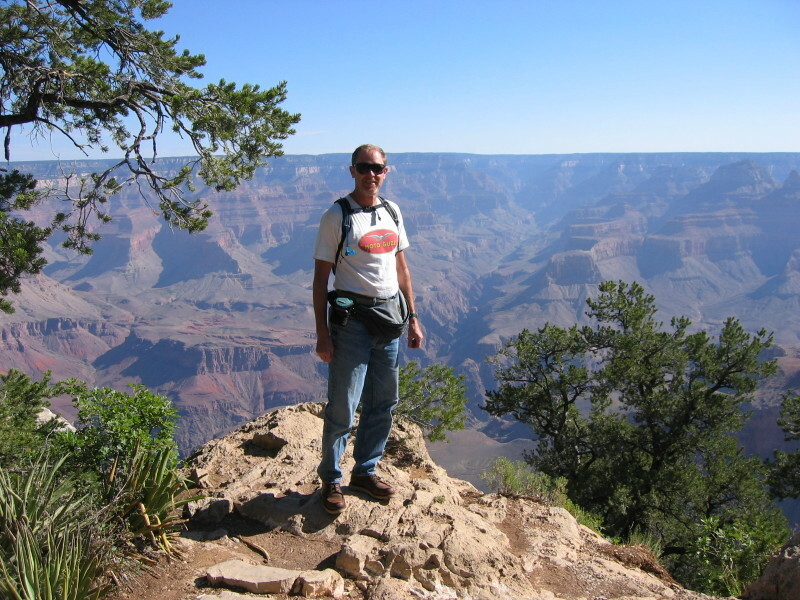 I still reached the canyon early and drove to several pullouts on the south rim, taking about a one-hour hike at one. From there, I headed northeast across the Indian Reservation and on to Kayenta, Arizona, and Monument Valley. What a spectacular place and I couldn't have asked for a nicer day! The road was virtually deserted and the temperature warm, but not uncomfortable, at speed. Just outside Cortez, the afternoon thunderstorms had started to build and I got caught in one. Not a big deal until it started to hail and the rain turned COLD! Hail really hurts when you add about 65 mph of velocity to it, so I stopped and stood in it instead. Better, but still not great. But, other than that short-lived episode, it had been a great day. The next day, I headed home, going up Colorado 145 through Rico, Colorado, and across Lizard Head Pass. This is one of my favorite Colorado roads. I made it safely home without incident. The Aluminum was comfortable and ran great, getting in the high 40 mpgs once I got out of California. Broken in, I guess, plus no freeway traffic. All was well in the fall of 2004 when I put the Aluminum away for its winter's nap with a little over 5,000 miles on the clock. -How many bikes actually have this problem? -How does the problem evidence itself - suddenly, or gradually over time? -What are the symptoms? Is that ticking from the right valve cover the beginning? -Is the supposed "fix" really a fix or just a bandaid? -If I have a problem, how long will it take to get the parts? Will I lose a whole riding season? The Aluminum was still running fine, but I decided I would rest easier if I sold or traded it and bought a '02 or earlier model with solid lifters. I hadn't known about the hydraulic- vs. solid-lifter issue when I had purchased the Aluminum, but I had gotten it for such a low price, it made the transaction easy to contemplate from a financial perspective. The solid-lifter bikes seem like a safer bet in the long run. So, to the Moto Guzzi classifieds I went, placing mine for sale and looking for a suitable replacement. It didn't take long until I found a buyer back in California. He was aware of the potential "hydro problem" and was comfortable with letting Guzzi fix the problem under warranty should it ever be necessary. So, the sale was completed and I arranged to have the Aluminum shipped back to California. As for finding a replacement bike, I had learned quite a bit in my past year of Guzzi research and ownership. For one, I really like the riding position and feel of the Guzzi "cruisers." I now understood the differences between the EV, Stone, Bassa, and Special Sport, subtle though they are. I decided that I wanted either a Bassa or another Special Sport and I really liked the looks of the black / gold and black / red Specials. You have to understand just how rare Moto Guzzis are in Colorado. I see maybe a dozen a year here and only because my eye is seriously tuned in to them. There is only one dealer in Colorado and they don't actually have any Guzzis in stock, but they will order one for you. 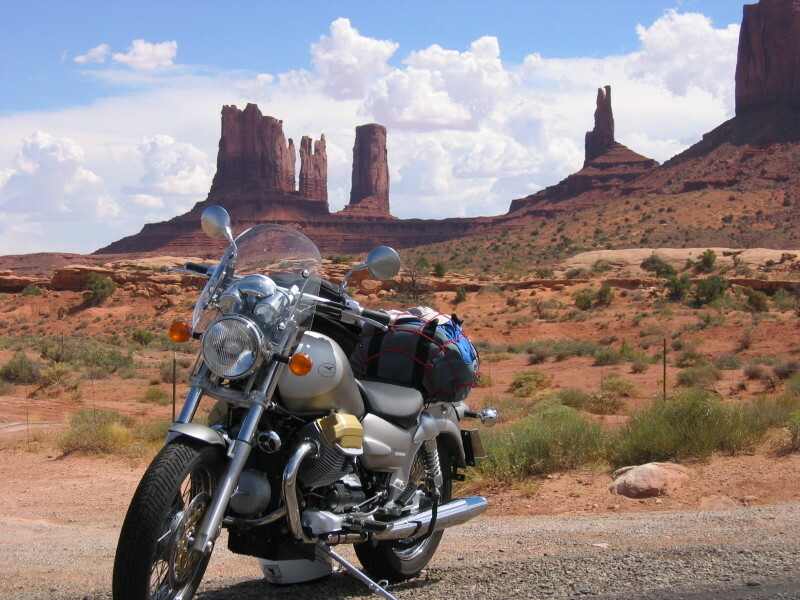 So, if you decide to buy a used Moto Guzzi, it is virtually certain that you will have to go out of state. Searching the Guzzi website, I found several 2002 and earlier candidates that caught my interest: a brand new '02 California SS in Pennsylvania, a nice '02 Stone in Texas, a '00 Bassa in Massachusetts, and a used '02 California SS in Minnesota. The one in Minnesota, a black and red SS with only 3,000 miles, seemed like the best deal of the bunch. It was traded in to a Yamaha dealer and they seemed anxious to move it. After a few days of talking with them, another trip to fetch a motorcycle was in order. The dealer was in Faribault, Minnesota, and they said they would pick me up at the Minneapolis-St. Paul airport. I got a one way ticket to Minneapolis for $74 (that is not a typo!) and I was off. I left Denver on a typical beautiful July morning, but as we flew east the cloud cover increased. Descending into Minneapolis, I was presented with a very wet and cloudy world. Not the best weather in which to start a motorcycle trip, but maybe it would be better in Faribault. I only had to wait about five minutes to find my ride. As we drove south on I-35 it really started to rain hard. Eventually, the traffic slowed to about 35 mph because it was raining so hard. It never rains this hard in Colorado and I was not really prepared for this. When we arrived at the dealership, it was still pouring, but I figured maybe that was good because it couldn't last too long, could it? We took care of the paperwork and I got my stuff loaded onto the bike. Still pouring. I checked out the spare parts, riding gloves, spark plugs. Found a nice quart of oil for $5. Hmm, still pouring. There was a restaurant across the parking lot, so I decided to make a run for it. I hadn't gotten so wet in ten seconds since I was in college in Florida! After lunch, it was still pouring, so I watched ESPN for awhile. It was approaching 2:00 and I had a planned to get to St. Joseph, Missouri, early the next day for reasons that will be explained later, so I decided to just brave it. I run back to the dealer and put on the dreaded raingear (dreaded because you tend to sweat in it and eventually get about as wet as if you weren't wearing it, only less comfortable). I headed south in the rain which was lighter now; well, okay, less heavy. Enough that I could actually see, which was a plus. Not far past the Iowa line, things began to improve, but I pressed on until I needed gas before I stopped to take the rain suit off. 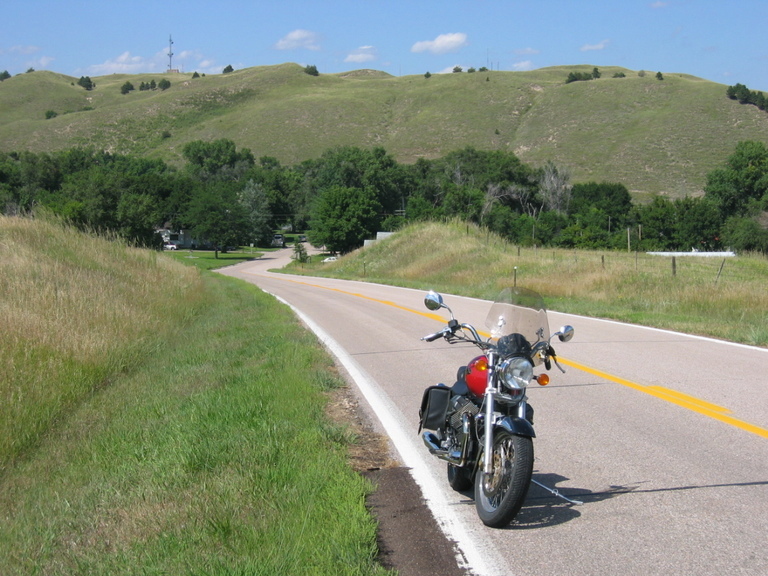 After refueling and taking a break, I was back on the road heading for Des Moines. Within probably 30 minutes, the sky had completely cleared - not a single cloud! It was a bizarre transition. The rest of the afternoon was beautiful! On a motorcycle, you definitely notice smells. Iowa is known for corn, but nevertheless, it smells like cows. Driving across Iowa is like driving through a 250-mile-long cattle feedlot (no offense intended to you Midwesterners, just an observation). I grew up in Missouri, so this shouldn't have surprised me, but it did. When I reached Des Moines, I left I-35 and took U.S. 169 south to Missouri. This is a beautiful road, rolling hills, immaculate farms, and bright-white-dirt side roads. Seemed a bit like New England in the Midwest. I wish I had taken pictures, but I was on a mission to make up for lost time. I didn't realize it before the trip, but U.S. 169 goes through the area where the book, "The Bridges of Madison County," was set. I never read the book, but it has made the area relatively famous. There were signs pointing to covered bridges and other sights along the way. It is a nice enough area that I would like to go back and explore when I have a little more time. "This fella's heading toward St. Joe. Any idea where he could stay?" "Is there a Motel in Stanberry?" "No, I don't think its there, anymore." "Used to be one in Albany." After a few minutes of debate, they decided there was a motel in Albany. When I got to Albany, I did, in fact, find a motel and, for some reason, it immediately brought to mind the Bates Motel from Psycho. But it was late and I was tired. The motel was an old-fashioned layout, with the office / proprietor's living quarters in the middle and a row of rooms at either side. I went into the office and rang the bell. Silence. Rang again. No response. I walked around to the back calling out, "Hello, anybody here," but no answer. There was a bar-restaurant across the parking lot with a few cars parked along the side, so I decided to check there. I told the waitress that I was looking for a place to stay, but there was no one at the motel. It turned out the waitress lived in one of the rooms and said she could help me. We walked over and she gave me a key, saying she would let the owner know I was there. I told her I'd be back in a few minutes for some dinner. Well, the shower worked and I finished without getting sliced up. As I was getting ready to head over for dinner, I realized it was raining again - hard. I didn't feel like taking a second shower, so I stood under the overhang and watced. It was dark out and there was lightning. Midwestern thunderstorms are something I remember from my youth, but one tends to forget the details. There is lightning branching across the sky like spider webs every few seconds. It's amazing, turning the world into a strobe chamber. After watching for awhile, I was thinking that I had seen more lighting that night than I would see in a year in Colorado. My new motorcycle had also been subjected to more rain that day than the one I was selling had seen in its entire existence. The center of the storm passed and the rain lessened enough for me to run across the parking lot to dinner. Watching the storm in the distance while I ate, I recalled how I used to sit on my father's lap in the backyard as we watched the distant lightning. It was almost a nightly event in the summer and something I remember fondly. After dinner, I wiped down the Guzzi and went straight to bed, as I had an early appointment with Ace in St. Joe. The next morning, on the way out, I snapped a picture in front of the "Bates." I had prearranged to have the bike serviced at Jackson's Cycles in St. Joseph. I wasn't sure the bike had received the scheduled 1,500-mile service and thought it would be a good idea before I drove it all the way back to Colorado. Jackson's Cycles is a small Moto Guzzi shop owned by Galen Jackson. The mechanic is Ace Malott, who is somewhat famous in Guzzi circles for his mechanical expertise. I needed to get there early because part of the service is to torque the cylinder heads and adjust the valves and this has to be done when the engine is stone cold. Jackson's is in what appears to be an old gas station with two garage bays facing the road. One of the garage bays is full of old motorcycles and parts and Ace does his work in the other bay. Unlike most repair shops, you are not banned from entering the service area for "liability reasons." Instead, you are expected to hang out there, drink Cherry Coke, and keep Ace company. You are also invited to help as much as you like. Within 30 minutes, we had the seat, gas tank, oil pan, exhaust pipes, and valve covers removed and all the fluids drained out of the bike. In the meantime, Ace started "recommending" little improvements. "See this switch here. It keeps the bike from starting if the kickstand is down and the transmission is in gear. But, they have a tendency to corrode and intermittently keep the bike from running as you drive down the road." Switch removed. "This air box cover restricts the airflow into the engine. Let's hacksaw these intake ports off and drill a few holes in it. She'll run a lot better." "These springs on the rocker arms get weak after awhile and will throw the valve timing off a bit. Why don't we pull those out and shim in these tapered roller bearings. That will get rid of all the slop." This was wonderful. I was thoroughly enjoying not only getting the bike set up right, but also the opportunity to watch and help Ace do the work. While Ace was working on my bike, about every 30 minutes someone would pull up on a Guzzi and come in to chat. Some had questions for Ace, some just wanted to talk and see what he was up to. One guy came in around 10:00 and stayed all day. He just sat there and talked with us about motorcycles. And, there were lots of motorcycle stories, most involving how Guzzis are so much better than Harleys and so much more interesting than BMWs and Japanese bikes. Ace told us stories about his son, who is a professional motorcycle racer. He told us about the 20 or so Moto Guzzis he owns, including the famous Yellow Monster, a 1992 California with several hundred thousand miles on it. Around noon, Galen declared, "We better get Alan something to eat." He ordered a bunch of pizzas and about five or six guys crowded around the picnic table out front and ate it. Whoever happened to be there, at the time, was invited, so it wasn't surprising that there were a few more folks there around noon than at any other time of the day. Ace worked on my bike all day. He wasn't just "servicing" it, he was making it the best he could. He removed bolts just so he could put "anti-seize" on them. Everybody treated me like a friend and Ace invited me back for his annual picnic in mid-September. Toward the end of the day, I realized something odd. I had talked with a lot of people but I hadn't heard a single cuss word from any of them all day. It really says something nice about the Guzzi "community." Around 5:30, the bike was finally ready. We took it down off the stand and Ace fired it up and dropped it into gear. It immediately died. It turned out to be a minor electrical glitch related to the switch that was removed earlier. About 15 minutes later, he tried it again and it ran fine. He was gone for about 20 minutes and I started to get a little worried, wondering if something had happened. He finally returned and said he had to get out of town a ways so he could get it up to speed, which meant taking it up to 120 in 4th gear. Now, it was my turn. I wasn't quite so aggressive, but boy did it run better! The acceleration was much stronger than yesterday and the engine was real smooth with almost no vibration over 3,000 rpm. Fantastic! When I pulled back in, Ace and Galen were standing there waiting for me. Galen said "Look at that ear-to-ear grin. Ace always lets you take it for a ride before he shows you the bill." But the bill seemed very reasonable to me for a full day's work. Ace had worked on my bike from 9:00 to 6:00. When he was totaling up the bill, I told Galen to add in half a pizza. He wouldn't hear of it and, in response to my insulting his hospitality, walked over to the tee-shirt rack and asked me what size I wore. When I arrived at Jackson's that morning I was expecting to get the bike serviced and be on the road by mid-afternoon. I had actually imagined myself asking politely if they would let me watch Ace so I could learn a few things about servicing Guzzis. I got way more than I had bargained for, including a few new friends, a good education, and a much better motorcycle than the one I had purchased the day before. I look forward to returning to Jackson's to pay Ace and Galen a visit someday. After all, it's only a nice 600-mile ride away. Saturday morning, I headed out for home. It was a nice day and I had allotted myself plenty of time, so I decided to take the "scenic" route across Nebraska. Pretty uneventful, but a lot more scenic than I had imagined. I stayed clear of the interstate, starting out west across a series of small county roads, then angling north to Grand Island. At Grand Island I caught Nebraska 2, which angles northwest through the "Sandhills." The beauty of this area lies in its lack of people, wide-open spaces, and expansive views. 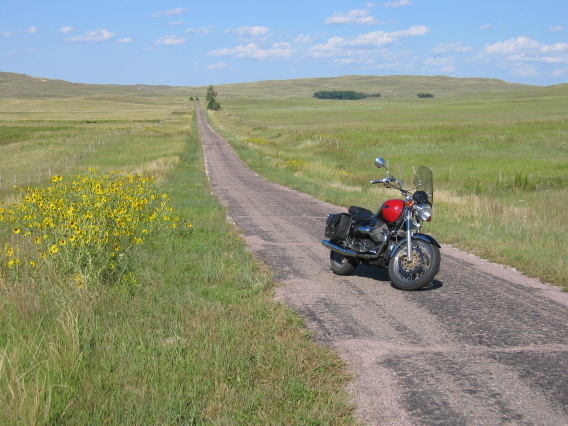 I went a few extra miles out of my way to find a fantastic road, 27 miles of SINGLE LANE asphalt through the Sandhills. I've not seen another road like this in the U.S. and I was the only vehicle on it. With the indirect route and the side trips, I had logged 700 miles on secondary roads by the time I got to Scottsbluff. Previously, the most I had ever ridden in one day was about 450 miles. Needless to say, I really enjoy riding the new bike. And my decision to swap the Aluminum for the '02 Special is, at least for me, a good one. There is one footnote to this story. My enchantment with Guzzis is strong enough that I decided I needed a second one. I just recently purchased a very nice '77 LeMans with only 17,000 miles on it. It has some of the classic character that I loved about that V7 Sport I had seen 1998, but even more to my liking. So the stable is full of Guzzis and my dreams are always of the next ride. Ride safe and I hope to see you out there!